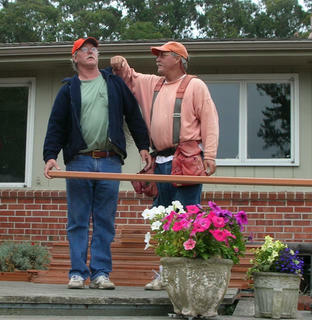 Meet identical Coastside twins, Greg and Guy Giedzinksi. 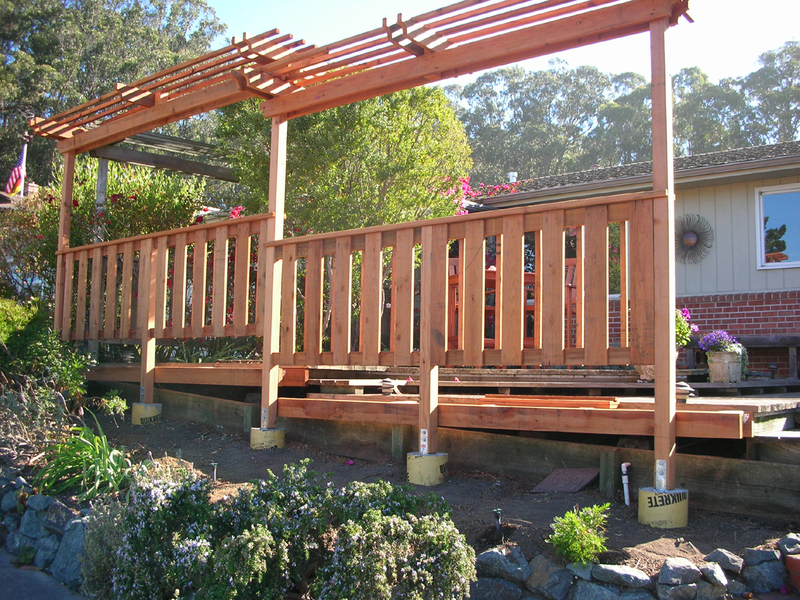 Guy is “retired” but brother Greg works for himself at his business called San Gregorio Design– building all kinds of neat stuff. 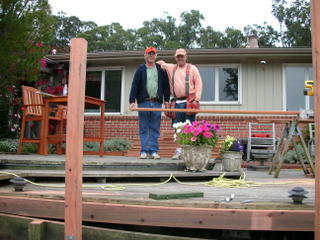 For awhile Greg and Guy were separated twins–Greg was skiing and working in Colorado and Guy lived in Montara and worked in South San Francisco. In the photo above the twins (L-Guy, R-Greg) are working on an outdoor project in El Granada. Half Moon Bay is the historic land of Father Serra and the Missions, of Wells Fargo Stage runs along the dusty roads, of old adobe homes, of the Indians, of the pioneering immigrants from across the sea. Of special historical interest is the James Johnston House, the first example of New England Salt box architecture brought to the West Coast. The structure still stands and restoration of the home is planned in the near future by the Johnston House Committee (ed. now completed). Upon completion, the Johnston House will be open to the public–a reminder of the elegant past of this charming coastal hamlet. But it was more than beauty and history that kept people coming to Half Moon Bay. The old rutted San Francisco wagon trail of 1854 became a modern highway. The three-day journey became a thirty-minute drive. Soon there were roads in all directions. The sun and the sea and the good,clean air drew residents in greater and greater numbers, many commuting to San Francisco and Peninsula cities. In an earlier post, I told you that the circa 1970s Half Moon Bay developers Deane and Deane (along with big corporaton partner Westinghouse) sought to personalize the Coastside, you know, give it a personality, stamp it with an identity. So they started the popular highway-clogging Pumpkin Festivalâin its own way similar to the Ocean Shore Railroadâs tactic of giving potential lot buyers a free ride to the Coastsideâs gorgeous isolated and never-seen-before beaches where some hack gave the captive audience a free lunch and a real estate pitch). 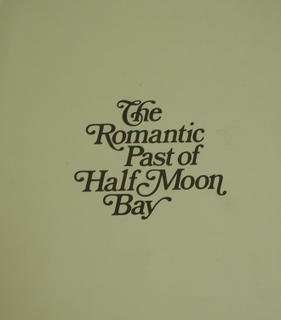 Half Moon Bay is San Mateo Countyâs oldest town. The first dwellers were, of course, the native Indians; the large shell mound at Pillar Point was their old village of Shagunte. Some people think the Indians of Shagunte greeted Sir Francis Drake when he landed along the coast in 1579. There is some evidence that it was Half Moon Bay where the old sea-dog anchored for repairs after raiding Spanish settlements in Mexico and South America. First use dsof the territory was made by the Mission Dfolores, as pasture land for their livestock. But real immigration did not begin until 1846, when the land-grant holders were driven out by the invaders during the Mexican-American war. 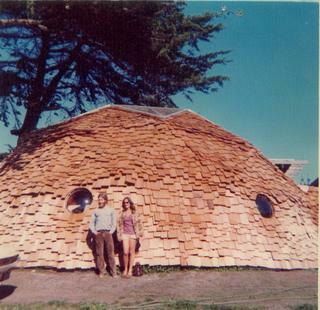 At that time there were only seven houses, built with adobe by Indian labor. Of these, five may still be identified. 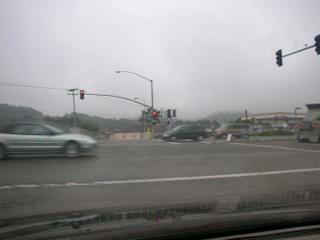 In fact, the streets of Half Moon Bay today run in the directions determined by the location of those old adobe homes. But even in the â49er Gold Rush days the town boasted little more than seventy people. By 1852, the population had increased by only fifteen people. In 1853, things changed. The territory became a town and, by 1855, had its own schoolâand its own saloon. 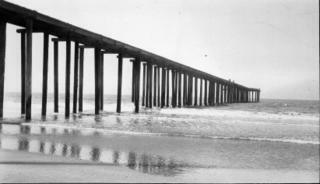 The first pier was built in 1858 near Pillar Point. The first âhighwayâ? to San Francisco opened in 1854, a wagon trail that replaced the almost impassable paths. 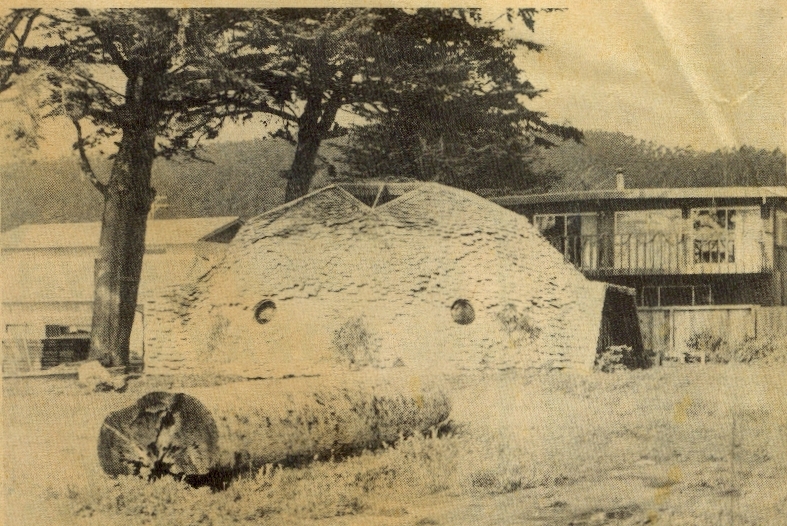 Then a big flour millcame to town in 1860âand Half Moon Bay began to grow in earnest. The Spanish were joined by the Scots and the Irish. And then came the Portuguese, who fished and grew grain and potatoes. Then came the Italian farmers to begin building the areaâs great artichoke industry. Next: Part II of âA Little Romanceâ? 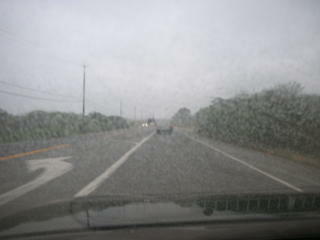 A foggy, drizzly day in Spanishtown. In the latter part of the 19th century (1870s) Half Moon Bay was known as Spanishtown because there were so many Spanish-speaking people living in the tiny community–there’s even a Spanishtown Historical Society which displays the town’s early history housed in a two=cell jail on Johnston Street (around the corner from Main Street). For years and years at Highway 1 and Medio Road in Miramar there was a tall wooden pole that had obviously been a sign post, advertising something, but what? You couldn’t see anything because the sign had been nailed over with wood. One day a local decided to take the pole down and when he did the sign beneath was revealed to read: Palace Miramar Hotel. 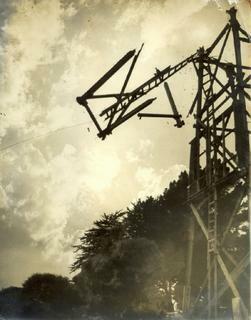 The wonderful photo by photographer Maria Demarest shows the stop-action thrill of the pole coming down–the most exciting event to occur on the ultra-quiet Coastside of the 1970s–but, sadly, I have no visual record of the sign itself. 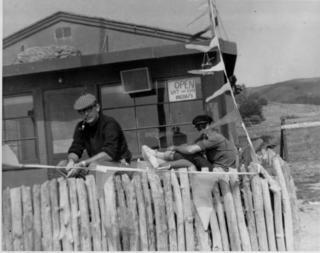 At left: Pete Douglas (in the back) and his brother, Jack, pose at the Ebb Tide Cafe, the hip coffee/jazz house, surrounded by artichokes and overlooking the Pacific Ocean in Miramar. This was the beginning of the Bach Dancing & Dynamite Society, today a world-class jazz house. (Actually, recently Pete brought back the flavor of the Ebb Tide Cafe, located in the same little building you see here). Come to think of it, Miramar Beach (which means to behold the sea) has been the scene of many historic events, paralleling the growth of the Coastside. Tiny Miramar Beach has been witness to the rancheros and the rounding of cattle near Medio Creek, site of the Coastsideâs first working wharf & seafaring community which gave way to construction of the Ocean Shore Railroad and construction of the beautiful Palace Miramar Hotel and restaurant. Then when Prohibition rolled in, Miramar became a home to the colorful rumrunners, bootleggers and the red-haired madam with her upstairs bordello at the Miramar Beach Inn (not to be confused with the Palace Miramar which was located at the other end of the street where the wharf once was). The land surrounding the hotels and roadhouses was planted with artichokes by farmers. The chokes were served in novel ways at restaurants in Half Moon Bay and the Coastside was shipping the artichokes all over, even to the East Coast, earning the title of âartichoke capitalâ?. And when the Ocean Shore Railroad filed bankruptcy, pulling up the rails, the Miramar Beach Inn and the Palace Miramar served customers delicious clam chowder and fond memories of other times. 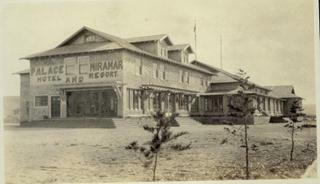 (The Palace Miramar burned in the 1960s but the Miramar Beach Inn still stands). Representing the beat era spiritually, former county probation officer Pete Douglas inventeed the Bach Dancing & Dynamite Societyâwhich metamorphised from the Ebb Tide Cafe, an intimate, hip coffee house with spontaneous acting-out, but more importantly the beginning of jazz music scene at the beach-this was in the late 1950sâto a bigger world- class jazz house featuring first-rate musicians playing the full spectrum of jazz. Peteâs kept the âBachâ?, as we locals call it, pure. Weâre so lucky to have a jazz house on the CoastsideâI can even walk there from my house. (Photo: When photographer Michael Powersâ dome appeared in Miramar in the 1970s, the structure became a curiosity piece in Miramar). 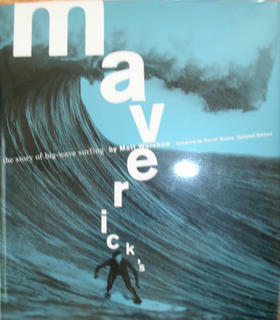 In the 70s greeting card photographer Michael Powers built a geodesic dome near the site of the then-gone Palace Miramarâ and behind Powerâs dome is where the future young, intrepid surfer Jeff Clark grew up, the Jeff Clark who, on his Coastside surfing journeys, was to discover and name world famous Mavericksâwhose immense winter waves bring world-class surfers to Half Moon Bay. Now weâre up to date. In Miramar, every historic era of the Coastside is represented, if not still seen, then it must be imagined. A married couple is in bed sound asleep when the phone wakes them up at 2 a.m. The sleepy husband answers and says to the caller: âWeâre about 200 miles away. I guess itâs okay.â? âWho was that?â? his wife says. âHe wanted to know if the coast was clear.â? 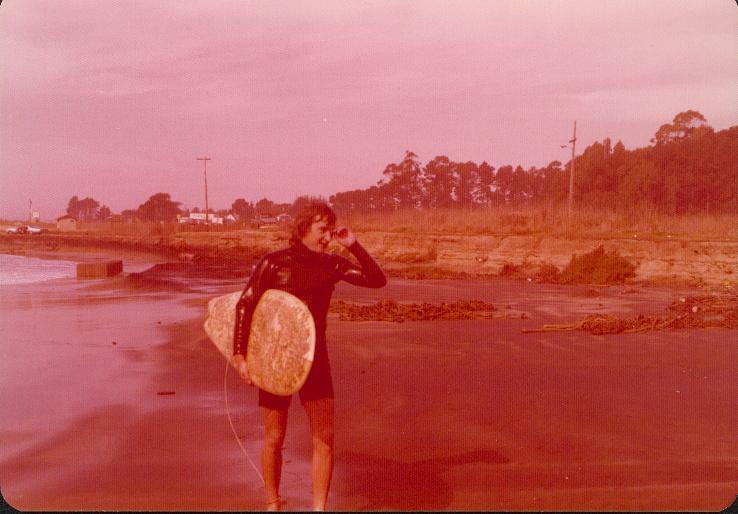 A few posts back I told you how I first got into Coastside history. I was obsessed with it and had to have everything I could get my hands on. Every time I collected a new photo, fact or anecdote, I felt so proud. I really did. 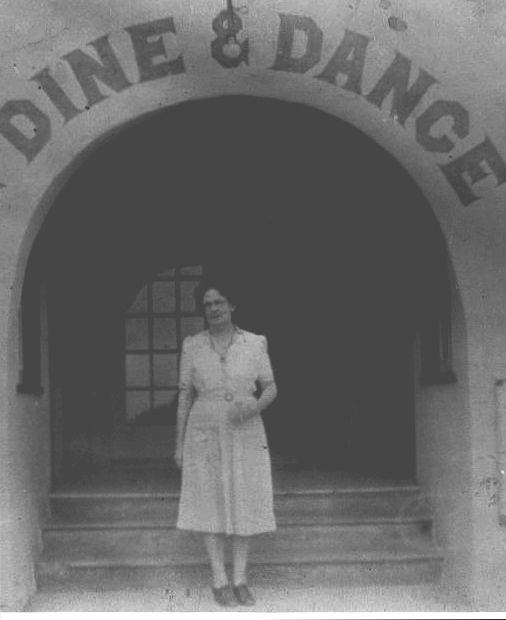 When I heard the Miramar Beach Inn had originally been built as a prohibition roadhouse– and even more tantalizing–that a madam named Maymie Cowley ran the place, I set out on a search for her. I figured there was a slight chance Maymie was still alive; she would have been in her 90s at the time. Alas, I was too late. She had died some ten years before I started my search for her. I did get information at the funeral home and found relatives and her last place of residence in Redwood City (After a robbery at the Miramar in 1955, her home since about 1916, she moved over the hill). I wrote the relatives and they sent me photographs of Maymie–nobody had these photos. I knocked on the door of Maymie’s last known home–a place she shared with another woman but couldn’t get anywhere. The lady did admit Maymie had lived there but I think she thought I was some sort of nosey official, what with my legal sized notebook and pen in hand. (I was so serious about my research). By the way, that’s Maymie in the photo, one of the pix her relatives from the Midwest sent me. (And what’s great is that the Miramar–that’s what locals call it–an historic roadhouse, still stands.